Funny bacon t-shirt for bacon lovers! Bacon lovers rejoice! This funny bacon t-shirt is the thing to announce your undying infatuation with the sweet succulent allure of BACON! This funny shirt design features the word 'BACON' in glorious ribbons of your favorite fatty meat. 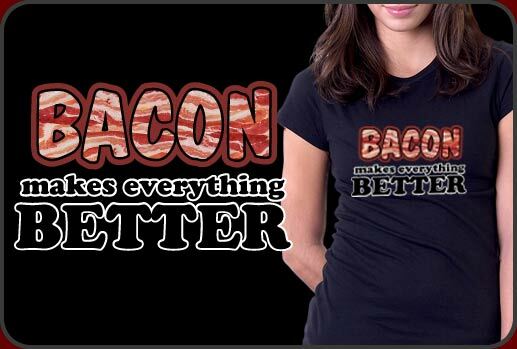 It's probably the truest statement ever put on a shirt, "Bacon makes everything better" I mean, there can't be a more truer message than that, right? Graphic T-Shirts With Hilariously Funny Designs- Coolest Graphic Shirts Anywhere On The Net!